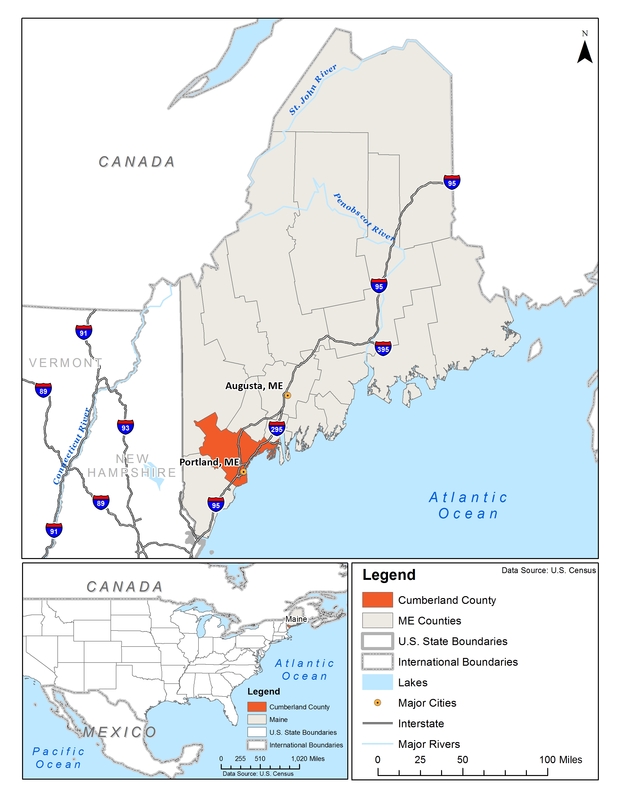 In March 2015, Cumberland County, Maine was selected as one of eight Communities of Opportunities (COOs) in the country with significant potential to strengthen ties between small- and medium-sized farmers and residents with limited food access. Working with the Growing Food Connections (GFC) project team, county stakeholders have since established a steering committee that has charted a vision for the future of Cumberland’s food system. This brief, which draws on interviews with Cumberland County stakeholders and secondary data sources, provides information about local government policy opportunities and challenges in the food system to inform the work of the GFC steering committee and stakeholders in Cumberland County. Cultivating Community operates Boyd Street Urban Farm, which has individual community garden plots and programming for youth. Cumberland County, located along the southern coast of Maine, is home to a deep tradition of fishing, particularly shellfish, small working farms up and down the coast, and is distinguished as a prominent foodie region, attracting renowned chefs looking to share their culinary skills in a small-town atmosphere. The county sits on the shore of the Atlantic Ocean. 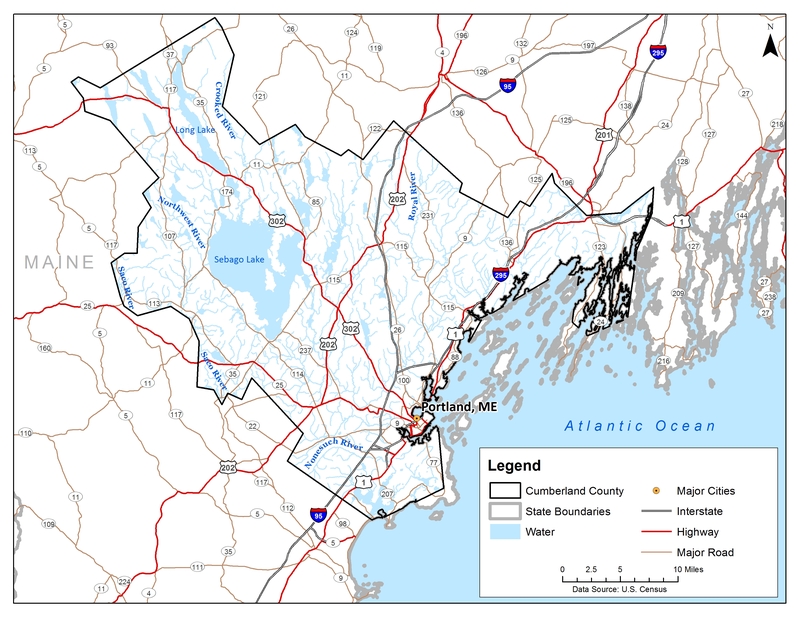 The most populous county in Maine, it includes the cities of Portland, South Portland, and Westbrook, along with 25 towns. Bon Appétit named the City of Portland “America’s foodiest small town,” and with that distinction, the city is sought out by tourists and locals alike to taste the latest local culinary fare. The ethos of Cumberland County, a small coastal city surrounded by established rural communities, is based on a strong work ethic as well as a desire to support the local economy and maintain limited development. Much of the effort to promote food security in Cumberland County is happening at the grassroots level and is organized by local not-for-profit agencies. Because of the high needs in the county, even agencies whose mandate is not food-related contribute to programming on food security.4 Farmers’ markets are an opportunity to provide local produce to Cumberland County residents. 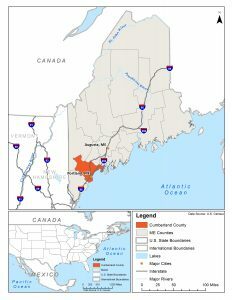 Although Maine is located in the colder northeastern region of the country, there are 92 farmers’ markets in the state, with 13 located in Cumberland County.13 One consumer advocate states, “We are lucky that there is a farmers’ market in every town that has more than 5,000 people in the state of Maine.”14 The price point of grocery stores and supermarkets is out of reach for 20% to 30% of the population: renters, new Mainers, individuals working minimum-wage jobs, and those with one income and children.15 Farmers’ markets can serve as the access point to local, affordable produce. A community stakeholder posed the question, “How do you create easy access to locally produced food, quality food at an affordable price? 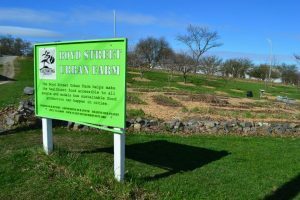 You need to make buying local food part of people’s routine, rather than making it an event.”16 Cumberland County farmers’ markets have the opportunity to shift the traditional farmers’ market format so that it better serves all residents and increases access to fresh, affordable local food. Cumberland County has a rich heritage of small-scale agriculture and food production, including a sizable seafood industry. In 2014 it was reported that food producers generated about $65 million, including $45 million in lobster catch alone, in farm and fish products, annually. Cumberland County is a significant contributor to Maine’s well-known lobster fishing industry.19 In 2014, a record year for fishermen, Cumberland County reported 11,655,792 pounds of live lobster landings, or 9.4% of the statewide capture of 123.7 million pounds. The county’s catch generated $45.96 million in value, comprising 10% of the statewide sale of $456.9 million. Maine’s huge lobster industry, which provides 80% of all US lobster, supports a larger industry. Statewide, the lobster trade also supports three million lobster traps fielded by more than 5,000 licensed lobstermen and women. Despite a rich food and agricultural heritage, starting and operating a farming business has its own set of challenges in Cumberland County. The economic prospects of farmers are limited. Sixty-six percent earn less than $10,000 a year and have a net loss of $8,000.15 Agriculture and rural infrastructure have survived in part because there are few development pressures in Maine.14 Increasingly, agriculture is beginning to feel pressure on farmland and land costs, making farming economically prohibitive, especially for beginner farmers. As several respondents stated, supporting local farmers and farming is engrained in the culture of Mainers, and Cumberland County is no exception. “ . . . It is not just about setting land aside – we have to make sure it is actively managed for agriculture or that we are making sure we are getting access to people and providing education.”8 The need for additional consumer advocacy and programming continues. An Extension representative observes, “The agriculture community doesn’t place a high enough emphasis on the importance of consumer education and food literacy.”5 A successful local food movement in Cumberland County needs a stronger focus on educating consumers on the value of agriculture. Small- and medium-sized farms make up the majority of agricultural production in Cumberland County, Maine. At the county government level, the Cumberland County Office of Community Development has used Community Development Block Grant (CDBG) money to fund many efforts that support the local food-system infrastructure, including “funded activities to distribute foods from food pantry warehouses.”3 The county has also leveraged federal funds from the Community Putting Prevention to Work (CPPW) program, which provides a long list of Cumberland County examples of public-dollar investments in food work.3 Over the past five years, the county government has become more engaged in food-systems work through the Cumberland County Food Security Council (CCFSC). The CCFSC was established following a food-systems assessment, Campaign to Promote Food Security, conducted in 2010 by the Muskie School of Public Service. The Campaign to Promote Food Security increased community awareness about food security and food access. The United Way of Greater Portland made a three-year commitment to support the CCFSC. The Good Shepherd Food Bank became the fiscal agent for CCFSC. The CCFSC supported a Child Nutrition Reauthorization Forum in 2015.10 Most recently, the CCFSC conducted a Cumberland County Food Systems Summit in May 2016 and was the lead organizer in Feeding the 5,000 in October 2016. In addition to CDBG funds, the Cumberland County government also invests significant resources annually in the University of Maine Cumberland County Cooperative Extension. There is also a strong partnership between the Cumberland County government and the Town of Bridgton. The two local governments applied and received a USDA Local Food Promotion Program planning grant, which spearheaded the report “Building Support for Community-Based Foods in the Lakes Region of Maine” in September 2016. At the subcounty level, several cities and towns are actively rebuilding community food systems. The City of Portland, for example, has taken several steps to strengthen the food system in recent years. Former Mayor Michael Brennan established the Mayor’s Initiative for a Healthy Sustainable Food System in April 2012, which morphed into the Shaping Portland’s Food System initiative.2 As part of the Mayor’s Initiative, the City of Portland Department of Parks, Recreation, and Facilities manages and oversees the city community gardening program in partnership with Cultivating Community, a local not-for-profit organization. The Department of Parks, Recreation, and Facilities oversees and maintains nine community garden sites. Most recently, the Portland Food Council was launched in January 2017. At the regional level, the Greater Portland Council of Governments (GPCOG) is proactive in developing businesses to support and enhance the local food economy. The council “refashioned [its] whole economic development strategy around food and energy and freight, which build on a number of assets that [are present].”15 In September 2016, the GPCOG was one of 12 US Department of Commerce-designated “Investing in Manufacturing Communities Partnership” regions. 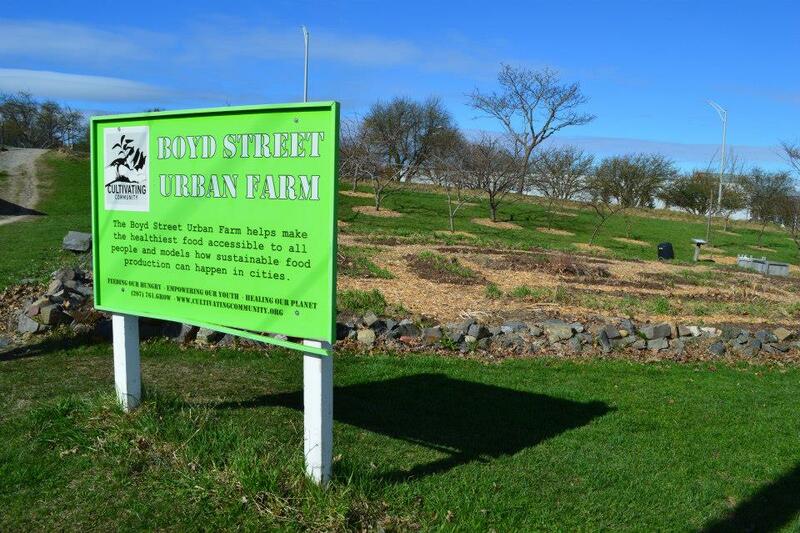 The designation will spearhead the proposed Greater Portland Sustainable Food Production Center. Collectively, as described above, the county, towns, and regional Council of Governments have taken several policy actions to strengthen components of the food system. Yet, there is opportunity to take additional actions to strengthen the food system in a more comprehensive and cross-sectorial manner across the food-supply chain. Two distinct needs were expressed in many of the stakeholder interviews, both by local government representatives and food-systems stakeholders: the need to build a more efficient local food infrastructure and the need to raise awareness of food insecurities that residents experience throughout the county. Local food infrastructure is a vital component for connecting producers with consumers. There is significant growth across the country in intermediated markets, which includes food aggregators, processors, and distributors.25 A food-systems stakeholder respondent stated the need for a big push in developing infrastructure that provides “more efficient distribution and delivery systems to strengthen that network.”26 Through policy and public investment, local governments can play a leading role in supporting and bringing locally produced and processed foods into mainstream markets. The private business sector also has a critical role in building the local food infrastructure. A local government representative pointed to a food hub as a potential example of private-sector engagement.15 The representative noted that it is imperative to draw on the private sector’s business experience, to determine “how to build up the intermediate infrastructure that gets the food from the producers to the institutions and consumers”8 and make such ventures profitable. Partnerships among local governments, private businesses, and non-profit networks have the momentum to connect local producers and consumers and strengthen the Cumberland County food system. A second important issue is the critical need to raise awareness that food insecurity remains a concern for many county residents.4 Despite having an ingrained “foodie” culture, parts of the county still experience food insecurity. A food-security awareness campaign that highlights the challenges residents face in accessing healthy, affordable, and culturally appropriate food has the opportunity to lessen the stigma attached to hunger. Refocus the Cumberland Food Security Council’s efforts on food-policy advancement, including but not limited to exploring the policy ideas outlined below. Ensure health-department regulations support farmers’ markets efforts to donate leftover produce to local food banks (such as Wayside Food Programs and the Good Shepherd Food Bank). Explore opportunities for agricultural landowners to pursue purchase of development rights for farmland protection. Continue to encourage a discussion of how local ordinances can support farm viability and success. Continue to increase the use of local food in the school-district cafeterias through local food-procurement policies. Develop educational programs and economic incentives to support small farmers who are interested in moving from direct market to institutional markets. Work with Cumberland County farmers’ markets to provide universal acceptance of Supplemental Nutrition Assistance Program (SNAP)/Electronic Benefit Transfer (EBT) funds at all farmers markets. Build relationships within all local governments to promote public support for comprehensive food policy and planning. Invest in intermediate infrastructure of the food system to strengthen stronger connections between area producers/growers and institutions/consumers. Facilitate collaborations between affordable housing programs and food-security programs as a way to reduce the double bind of housing and food costs experienced by low-resource families/individuals. Encourage homeowners to turn a portion of their yards into a food-donation garden. Through collaborations and partnerships that exist across the public, private, and civic sectors in Cumberland County and through policy and planning efforts, the community has a unique opportunity to foster a grounded connection between local farmers and consumers in a way that is respectful, equitable, and sustainable for all residents. Information in this brief is drawn from multiple sources. Quantitative data sources include the 2014 American Community Survey (ACS) five-year estimates and the 2012 US Census of Agriculture. Qualitative data include 15 in-depth interviews with representatives of various sectors of the food system as well as Cumberland County policymakers and staff. Interviewees are not identified by name but are, instead, shown by the sector that they represent, and are interchangeably referred to as interviewees or stakeholders in the brief. Interviews were conducted from April 2015 to September 2015. Qualitative analysis also included a review of the policy and planning documents of Cumberland County, which were reviewed for key policies and laws pertaining to the food system, and a review of the minutes of the Growing Food Connections steering-committee meetings. The GFC team is grateful to the Cumberland County GFC steering committee, Cumberland County government officials and staff, and interview respondents for generously giving their time and energy to this project. 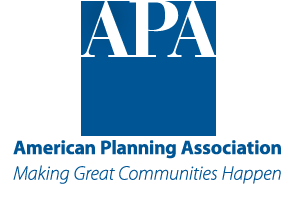 The authors thank colleagues at the Food Systems Planning and Healthy Communities Lab and the School of Architecture and Planning at the University at Buffalo, Ohio State University, Cultivating Healthy Places, the American Farmland Trust, and the American Planning Association, for their support. This work was funded by a grant from the National Institute of Food and Agriculture (NIFA Award #2012-68004-19894). DC: United States Census Bureau, 2014). 3. Interview with local government representative in Cumberland County (ID 15), 2015. 4. Interview with local government representative in Cumberland County ( ID 23), 2015. 5. Interview with consumer advocate representative in Cumberland County (ID 25), 2015. 6. Interview with extension representative in Cumberland County (ID 100), 2015. 8. Interview with local government representative in Cumberland County (ID 13), 2015. 9. Interview with farming and agriculture representative in Cumberland County (ID 26), 2015. 10. Good Shepherd Food Bank, “About Us,” Accessed May 9, 2016, http://www.gsfb.org/about/. 11. Interview with local government representative in Cumberland County (ID 18), 2015. 12. Interview with consumer advocate representative in Cumberland County (ID 27), 2015. Accessed May 10, 2016, http://www.waysidemaine.org/food-rescue. 16. Interview with consumer advocate representative in Cumberland County (ID 20), 2015. 17. Interview with local government representative in Cumberland County (ID 22), 2015. 18. Interview with farming and agriculture representative in Cumberland County (ID 19), 2015. (Washington, DC: United States Department of Agriculture, 2012). Cumberland, Maine, (Buffalo: University at Buffalo, 2015). Ships Portland, vol 2016, (Portland, Maine, 2015). County-Type Areas, (Washington, DC: United States Census Bureau, 2012). Homepage, Accessed May 10, 2016, http://www.gpcog.org/. 25. City of Portland, Maine, Code of Ordinances, (Portland: City of Portland, 2014). 26. Interview with retail representative in Cumberland County (ID 21), 2015. (Buffalo: Growing Food Connections Project, forthcoming). Portland, Accessed November 20, 2016, http://www.maine.gov/labor/cwri/laus.html. Recommended citation: Leccese, Jeanne, and Samina Raja. “Building on the Strengths of Land and Sea: Policy opportunities for Strengthening the Food System in Cumberland County, Maine.”In Exploring Stories of Opportunity. Edited bySamina Raja, 9 pages. 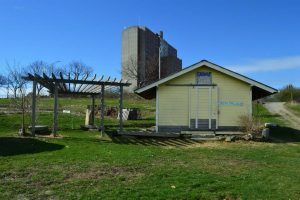 Buffalo: Growing Food Connections Project, 2017.